Does your Instagram account need a boost? Have you gone months or even years without ever analyzing what’s working and what’s not? You’re not alone. An Instagram audit might not sound like the most fun and exciting thing in the world, but it can help you out tremendously and uncover some interesting bits of information. The problem most brands run into is figuring out where to start. Either that, or they end up spending more time than necessary because they don’t have a plan of attack. Instead of trying to figure it out as you go, we’ve outlined a simple Instagram audit any brand can do in 60 minutes or less. If you’re not sharing content that resonates with your audience, it’s going to be next to impossible to be successful on Instagram. For this first step, we’re going to look at your photos/videos, captions, hashtags and posting frequency. Your goal is to find out what type of content performs best so you can share more of it. Auditing your Instagram posts is simple as long as you have the right tools. Relying on Instagram’s native platform to check the performance of your posts is time consuming and inefficient. 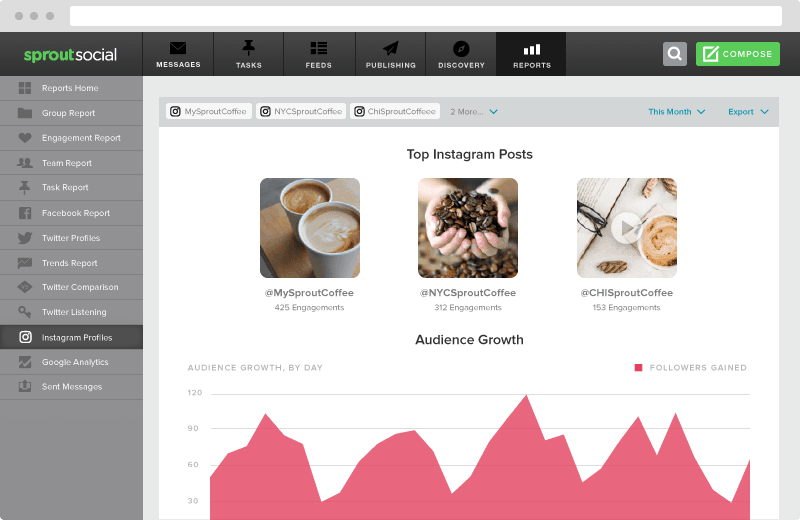 Instead, use a tool like Sprout that has in-depth Instagram reporting features. As you’re auditing your posts, don’t just look at the numbers. Pay attention to the photos and videos themselves. Are there any similarities? You might notice photos with people in them get more comments than product shots. Or your videos might drive significantly more engagement than photos. Remember, the goal of the audit isn’t just to figure out what works. You’re also trying to understand why it works so you can improve your strategy. While your photos and videos are the star of the show on Instagram, don’t underestimate the value of a good caption. Your captions give you an opportunity to add context to the content you share. Plus, even though you don’t have the ability to add clickable links, you can still use your captions to add a call to action. As you go through your top posts, look at their captions. Similar to what you did with your photos and videos, look for similarities. Do your top captions ask questions? Do they direct people to click on a link in your profile? Do they use emojis? The more you understand what attracts people to your Instagram posts, the easier it’ll be for you to replicate the results. In addition to looking at your content and captions, you should also look into your hashtags. On Instagram, hashtags are used to help people discover new content, which makes them very useful when you’re trying to grow your presence. Don’t worry, you don’t have to manually go through all your posts and record which hashtags you used. Sprout can do it for you. Your most commonly used hashtags on Instagram. 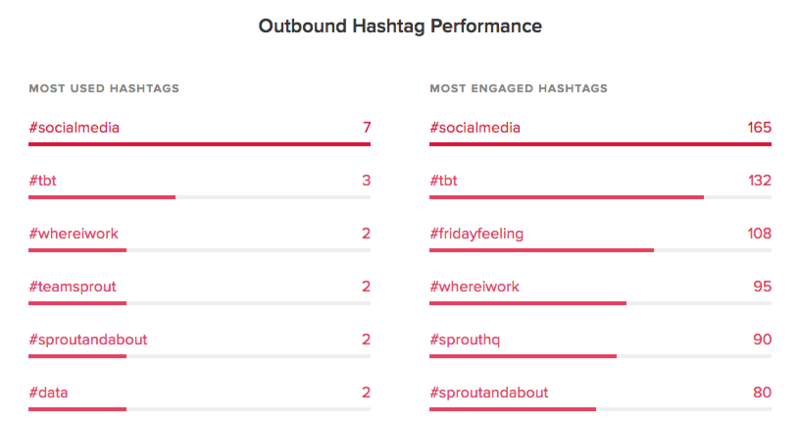 Your hashtags that get the most engagement. Keep track of your most engaged hashtags in a word doc or note apps. Then when you’re getting ready to share a new post, open your doc and look for relevant hashtags on your list that you can include. Don’t just paste all of your most engaged hashtags into every post though. Only use them when it makes sense. Since its launch, Instagram has stressed the importance of posting content in the moment. While this approach is fine for personal use, businesses need the ability to plan out campaigns and share content at specific times. That’s why posting frequency is important. For this step in your Instagram audit, we’re going to look at when and how often you post. Despite the switch to an algorithm-based feed, posting frequency is still important on Instagram. You want to find the sweet spot between posting enough to be seen, and overwhelming your followers with too much content at once. There is no universal number for how many times you should post on Instagram, or any other network for that matter. You need to look at your analytics and see what frequency works best for you. 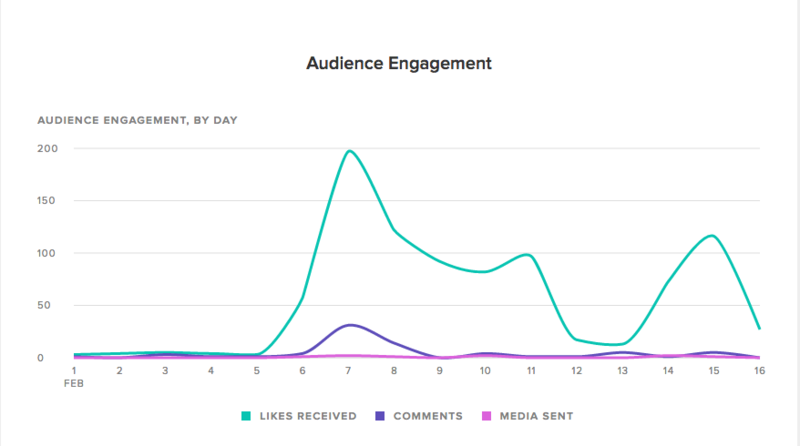 Sprout graphs your daily engagement alongside how many posts you send per day, so you can see the direct correlation between how often you post and the amount of engagement you receive. The other part of the equation is finding out the best time to post on Instagram. According to our research, Mondays tend to drive the most engagement. However, you’ll have to experiment with your profiles to find the best time to post for your audience. Your followers may be more active during the weekend or in the evenings. Look at your most engaging posts and see what time they were posted. 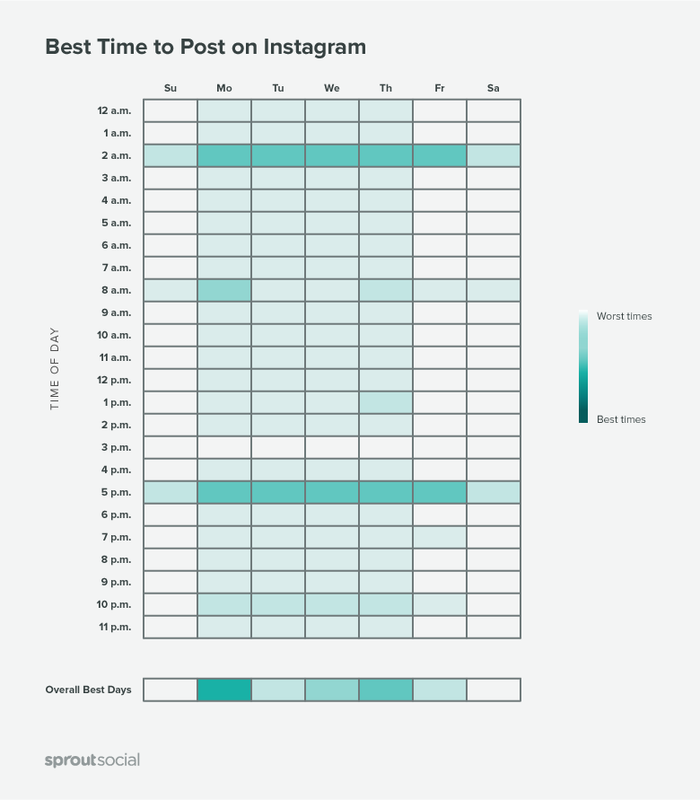 You can find the time you published your Instagram posts in Sprout’s reporting. Simply click on any of your posts, then hover your mouse over the post date. 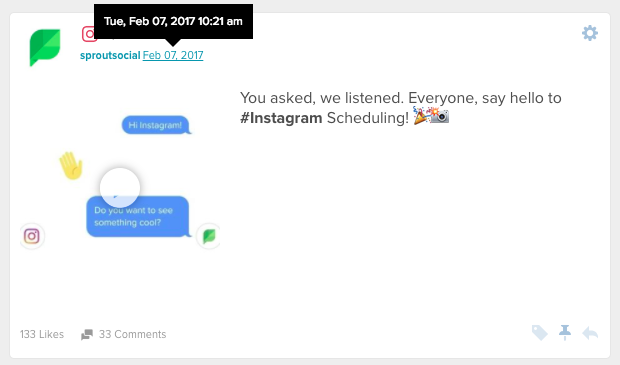 Once you have an idea of when your audience is most likely to engage, you can use Sprout to schedule Instagram posts for those times. With all of this information you should have a good idea of what type of content to post as well as when to publish for the most engagement. Next, let’s take a look at who’s following you. Getting to know your audience will help you share more relevant content and give you insight into who your potential customers are. While you may have a target customer in mind, you could uncover a new market by auditing your Instagram followers. According to one study, 8% of Instagram profiles are fake and 30% are inactive. Having bots follow you might not seem like a big deal since a majority are harmless and don’t actually do anything. However, that lack of activity is also one of the downsides to fake followers. They can make your reporting inaccurate because your data will be based on a combination of real and fake followers. 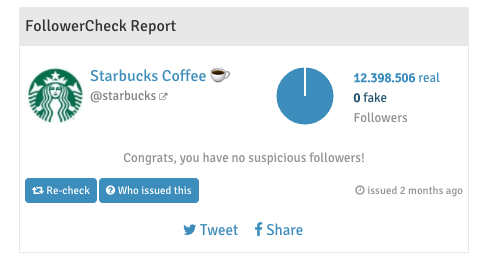 Having fake followers also reflects poorly on your brand. Even if you didn’t buy them, having thousands of followers with zero engagement looks suspicious. The last thing you want is for people to think your company is trying to mislead them by padding your follower count. If you just want a quick look at how many bot followers you have, you can try this tool. It’ll give you an overview of how many fake followers an account has. When you find fake followers, you can block them to make them unfollow you. Now that you’ve gotten rid of your fake followers, you can analyze what your real ones like. You can go as in-depth or high-level as you’d like here. The goal is to get a feel for who your audience is and what type of content resonates with them. This is in addition to the info we gathered in the first step of our audit. This time, you want to see what type of content they like outside of what your brand shares. Take a look at the other brands they follow and look at the content those accounts publish. Finding similarities in the brands your audience follows can give you a better understanding of what they want to see. For example, if you notice your followers like brands that post behind-the-scenes photos and videos, you can incorporate more of that content into your own strategy. Influencer marketing has become a wildly popular Instagram marketing strategy used by brands of all sizes. Your Instagram audit is the perfect time to identify influencers to reach out to. Start by making a list of known influencers on Instagram that would be a good fit for your brand. Look at the type of content they post, how much engagement they get, and who their audience is. Another way to find influencers is with Sprout. We have a report that shows influential Instagram users (based on follower count) that have commented on your Instagram posts. Since they’ve already engaged with you, they’re likely familiar with your brand and will be more likely to work with you than someone you don’t have any type of relationship with. After you’ve gathered your list of influencers, you can start thinking of ways to include them in your strategy. Check out our influencer marketing guide for some ideas. Last but definitely not least, you’re going to audit your Instagram profile and branding. Since Instagram doesn’t have a ton of profile settings, this step won’t take too long at all. Make sure your logo is up to date and properly sized. From time to time, social networks change their image sizing so you don’t want to end up with a stretched out or pixelated profile photo. Check out our image size guide to get the most up-to-date dimensions for any social media profile graphics. Also, ensure your logo on Instagram is consistent with your other social media profiles. For instance, you’ll notice we use our signature leaf icon across all of our social media channels. Keeping your profile images consistent makes it easier for people to identify your brand no matter which social network they’re on. Is the information in your Instagram bio still relevant and reflective of your brand today? If you haven’t touched your bio since you created your account, it might be time for a refresh. There’s no rule that says your bio has to stay the same forever. Also, your bio doesn’t have to be the same across each network. You can customize it to fit each platform. For Instagram, that might mean including a branded hashtag you want people to use when mentioning your brand like Under Armour does. Think of creative ways you can use your bio beyond just telling people what your company does. What page on your website is your profile link pointing to? Some brands like to change their profile link to a new blog post or special promotion. If that link is outdated, this is the time to switch it out. If you’ve had a link to your home page there forever, you can also consider trying something new. For instance, one popular trend is to use your Instagram profile link to promote your latest blog posts or even products. Airbnb posts photos of properties people can rent, and uses their profile link to direct people to a page on their site for more information on each rental. Don’t treat your bio as an afterthought. Instead, use it as a tool to help reach your social media goals. Whether you’ve been on Instagram for a while or just jumped aboard recently, it’s never a bad time to audit your account. Looking at what you’ve done is one of the best ways to help you plan for the future. Put the steps you’ve just learned into action and kickstart your Instagram audit today. And don’t forget to sign up for a free trial of Sprout to make the audit much easier.